The source is fed by the glaciers of the Dovrefjell (gorge/mountain), under the 7500ft peak, Mt. Snøhetta. Home to some of the richest plantlife in Northern Europe along with true wild Reindeer, Polar Fox, Golden Eagle and Musk Ox. A decent of 1630 metres in approximately 140 kilometres makes for a rapid and interesting descent. North flowing from the marshy heights of the Dovre massif it then follows the E6 highway for a while alongside the middle-ages pilgrimsleden (pilgrims road between Oslo and Trondheim) past Kongsvoll, an inn still operating since the 1100´s. 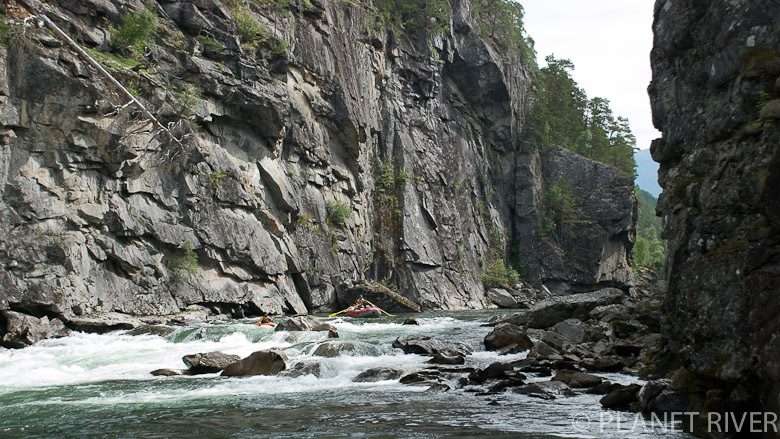 Near the town of Oppdal, the river starts heading west where commercial rafting enthralls visitors and tourists through some impressive drops and technical rapids, with an option for the experienced rafter and kayaker to tackle the Gråura canyon at lower water levels. The Driva is joined by its largest tributary, the Grøvu soon after. The ever widening Sunndalen valley comes next with long continuous sections of white water for the last 35 kilometres ( including a mini-canyon at Romfo ). This section is known for it´s Sea Trout fishing, ranked in the top 2 (volume) in Norway. The river finally ends its journey at the town of Sunndalsøra, at the head of the 60km long Sunndalfjorden. Scott caught the train. Rob and Ine drove the loaded white van and dropped off food stashes. We regrouped at Hjerkinn train station and Scott was stuffed into the back for the last 15 dirt kilometres to the end of the road near Snøheim. A 3 hour hike to the glacier-melt lake with all our gear and boats. Two nights camped at 1630 m below Mt. Snøhetta in a snow and sleet blizzard was welcomed. We needed the rest. On departure very little water forced us to drag and haul our gear the first 5 km down Stridaai creek to Snøheim in near freezing temperatures. Arriving at Snøheim lodge we were invited to stay in a cabin with a wood stove. With the lodge under construction we collected scrap to keep it fuelled and us toasty warm. Flemming came to visit us with a bottle of wine and new kayak, as we had trashed 1 on the portage down to the confluence with the Svone. We spent 2 nights in the cabin waiting for the weather to clear. Four days to travel 10km. Time to get going. Luck was now on our side as the weather opened up beautifully and the river had filled from the foul weather. Technical and shallow with little drops we bombed down the Svone to the E6 highway under brilliant blue skies and the snow-dusted peaks of Dovrefjell our beautifully painted backdrop. The next day we found ourselves at Kongsvoll Inn, collecting a resupply of food and recharging batteries. The valley walls here are steep and shaded. Waterfalls pouring out of the dizzy heights. The gradient was continuous with acouple of portages. A section of river we had anticipated to be difficult turned out to be super fun,we had water. The advantage with the road running right next to the river is you know that help, if needed, is right there. The negative to this, is the extremely sharp rock which devours plastic kayaks, created from road construction, obstructs the shore and riverbed. The valley was starting to widen up after a visit to the Lapp camp souvenir store, to stretch the legs and buy reindeer salami. Approaching the scarred mountainside at Eidsvoll skifer mines we ran a set of rapids with amzing rock strata that had been shined smooth by countless molecules of water. Our days in the wild were over. Farms, factories, traffic and pollution was evident. We confluenced with the Åmot River at Engan and made our way to Magalaupet camping site. The river dives down and under a river-wide monster rock. We scouted a portage route and soon found that the river downstream was going to be toughgoing for the next three kilometres. Rob decided to run the rapid under the bridge after being warned not too. A thorough spanking in the hole (luckily not swimming), gave Scott and Ine mild forms of heart failure and a reminder to all that we were here to document the river and not be the first to run potentially cool and dangerous rapids. We spent the next five hours scrambling through the bush, paddling across calm pools, dragging our gear through farmers fields, sweating, cursing and getting munched on by mosquitos. We dodged waterfalls, sieves, syphons and sketchy drops and emerged at Gottem with an altered sense of humour. A late lunch at helicopter eddy followed by cruisy floaty pools to Granmo camping near Oppdal town. Gyda and Flemming had our vehicle waitingfor us there with fresh strawberries and ice-cream. Yumm. The Driva River had flowed on a northerly route here to Oppdal and then bouncing off the mountains we were now on a westerly course. The river was big enough to accomodate a raft. Lighten the loads in the 2 remaining kayaks and put Ine in the driving seat. The commercial raft section was next and was good to relax a little in familiar surrounds. Scott had a tough night, turning a purple shade of green and barking to the midnight moon with a 24 hour stomach virus. Fishing was taken up with enthusiasm after hearing stories of Salmon and Trout of epic proportions. Our luck was in another fisher somewhere else. A short portage at Ishol, followed by gentle pools and class 3 rapids, we approached Graura canyon. An absolute blast of classic class 4 pool and drop rapids for about 13 km. The first rapid, Storfallet is the biggest and puts your mind to where it needs to be. Some of the rapids are unscoutable fromshore and require river-reading skills at the least. Steep canyon walls would make an escape out of this canyon an expedition in itself. We had our moments with Scott taking a beating and swim and quickly retrieved gear. The same rapid caused more chaos, a memorable surf by Ine in the raft with Scott performing rope-rescue. Fishermans paradise from the town, Gjøra and confluence of Grøvu to the mouth of the Driva. Although getting deeper, the valley had widened. Farms, campsites, highway 70 crisscrossing the river from left to right and back again, and waterfalls hundreds of feet high. Approaching the ocean the humidity increased, vegetation was thick and jungly. Our new obstacle was dodging fishermen. This lower section of the Driva is a hot spot for Salmon and Sea Trout fishing. Land access is strictly controlled and observed. Giving them space put us in the slow backwaters. Frustrating as it was we quicklylearnt the technique to keep the peace. The nights were spent at campsites in cabins, a luxury that was enjoyed compared to our last 25 days in tents. It took a bit of fizz out of Friluftsliv (the outdoor life). Musgjerd Rapids were worth a scout, the river constricted here and now with a larger volume, there were a few raft and kayak eating holes. The rapids at Romfo were good and solid with a short portage avoiding an overhanging undercut midstream. The last 10 kilometres of river meander over smooth pebbles and around islands, civilization creeps closer with small villages growing to small towns. The many waterfalls are spectacular, raining down the 500-800 feet cliff walls with the odd glimpses of perennial snow-pack in the peaks valleys. All of a sudden there is a giant alluminum factory with steam and smoke belching out of her on the horizon. Then, the water has stopped moving downhill and we arrive at the calm and clear fjørd. We are there, here, the end. A few cans of beer, a slab of biltong. A loose pack of stinky gear chucked into the van and we were out of there, a lot quicker than it took us to get there. Job Done.